Today was a Sell day and did they ever sell. On the conference call on Saturday I answered someone as to what I saw in the TTT numbers for Monday, and I said that based only on TTT the Bailout package would not pass since most of rally was done on Friday. You also notice that we had a projected low on ES of 1172 and that offered resistance for a while. 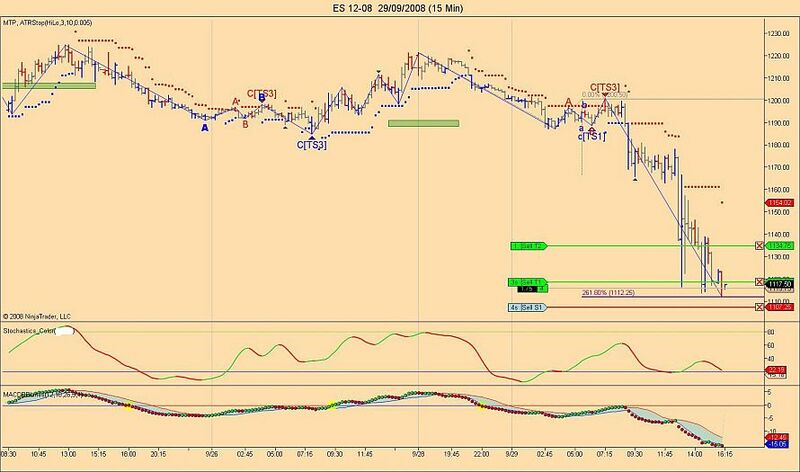 I don't know if the ES has hit its high for the day, but I made a 5 wave ct up and had confluence at 1165.5 so I took a short on 2 lots. Took partial profit so b/e at worst and it might do me the favor of some cash. Not so good after all. I got stopped out for a small profit. Trying it again. If I am reading right ES SSd highest rally was 24.5 and today it is around 50, yes? Yes you are right but the markets are recovering from one of the biggest drop in a long time The average range for the Sell day is 30 points and we 107 yesterday. How about those SSD rally #s Rich. Am I looking at it right? Like I said in my comments in last night' report and in a post here we had very BIG odds of getting back above the Buy day low. YM and TF made it and NQ +ES gave it the good old college try and came close. So today it was the wrong day to take shorts unless you exited quickly as soon as you could bank profits. Today was the SS day and like I mentioned in my comments last night we needed to get back above the Buy day low.